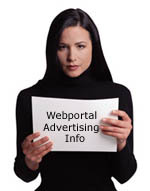 Webportal.com.my allows our advertisers to pick the best Sections & Positions in which to present their banner advertisements to potential customers. From the list below, you can get a rough idea as to how many different type of advertisement placings Webportal.com.my currently offers. Banner Size / Pixels: Banner Size is measures in terms of PIXELS. Basically the more pixels a Banner consists, the larger the banner will be.